The Bluetooth-powered lost item finder called Tile, which last summer raised $2.6 million via crowdfunding, has finally begun shipping, the company now claims. Early backers may be a bit skeptical, given the delays the company experienced since raising a significant round of funding many months ago, then not being able to deliver in a timely manner. But over the Memorial Day holiday here in the U.S., Tile’s Twitter account has re-tweeted photos of at least one happy customer’s receipt of the Tile device as proof of the shipments as well as other accolades, and promises to publish a more complete ship schedule soon. For those wondering when their own Tile will arrive, the company notes that it will ship in order by the date the pre-order was placed. 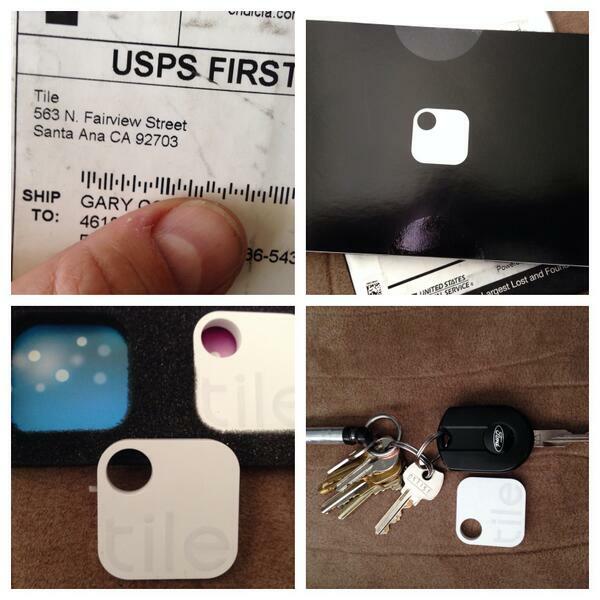 Or in other words, Tile’s earliest backers will receive their devices first, as it should be. Despite not having a product on the market (until now, apparently), Tile became one of the buzziest new companies in the connected device space, offering small, affordable, square-shaped dongles which you’re able to attach to real-world items like wallets, bikes, suitcases, bags, keychains and more in order to keep track of them when they go missing. These Tiles, as the dongles are called, work alongside a mobile application that lets you view the Tile’s last known location. Tile gained a lot of attention for its record-breaking crowdfunding campaign last year, but then failed to meet promised deadlines. In the time since its raise, Tile has faced competition from a number of companies hoping to tap into the latent consumer interest in connected devices, and capitalizing on Tile’s inability to meet that demand. Devices like Duet, TrackR, StickNFind, Lapa, and others have stepped into fill the void, and yet, Tile with its millions in funding and its thin and sleek devices, still seems to be the one to beat thanks to the viral attention it received in months past. The company says Tiles will last for a year before needing to be replaced. (Unlike some other competitors, Tile’s batteries are not user-replaceable.) This is both a positive and a negative, of course. It’s what allows the Tile device its slimmer appearance, but on the other hand, it means consumers will always have to order more dongles, which are more expensive than the batteries themselves. Tile is still accepting orders, offering one Tile for $19.95 or four Tiles for $59.85, and more. CEO and co-founder Nick Evans recently posted to Tile’s support site that customers will be asked to confirm their shipping address approximately two weeks before their order ships, noting also that early backers should have already received this email. In addition, the company released more info on its blog on Friday, showing Tile customers what their package will look like, what their first steps should be, and more about the way the device works. Stay tuned.